A free standing pull-up bar is a great choice for anybody who isn't satisfied with pull-up stations or wall mounted pull-up bars. Pull-up stations can be clunky, and the "all-in-one" aspect can become annoying and simply get in the way when you're trying to work on exercises such as pull-ups and chin-ups. Wall mounted and door frame pull-up bars don't offer much versatility, and the user is often limited by the available space they have to work in. This is where the versatility of a free standing pull-up bar can be well worth the extra spend. In this guide I'm going to review the different free standing pull-up bars available, provide a recommendation of which bar is best, and answer the most commonly answered questions around buying a free standing pull-up bar. The table below provides an overview of the different free standing pull-up bars we reviewed, ranked best to worst. Click on any title to check its current price. For your ease, the pull-up bars below are listed in recommended order. Max user weight (for pull-ups): 110kg. 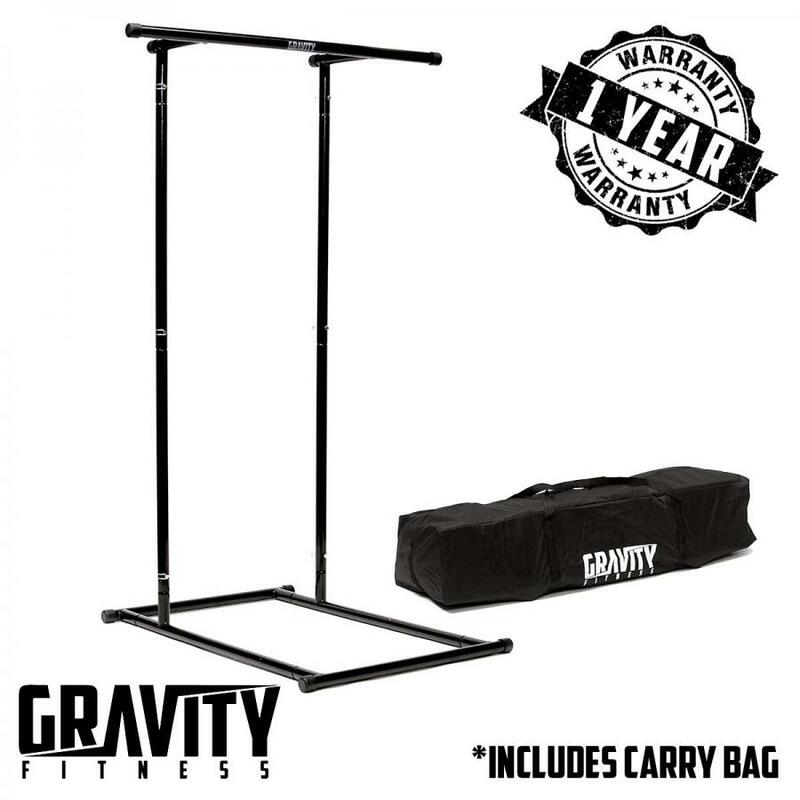 The Gravity Fitness Pull Up Rack is designed to solve two key problems that a user may have with other free standing pull-up bars, specifically the 'Power Cage' type bars listed further down the page. It is designed to be easily dismantled and can be used for a greater range of exercises than its competitors. Because of its design, the Gravity Fitness Pul Up Rack can be packed away within a matter of minutes. It comes with its own storage bag so that you can simply store the bar away neatly, or even use it to carry the bar comfortably when transporting it elsewhere. This is great for those who prefer to workout outside in such a weather dependent country like the UK! Although the design allows the bar to be dismantled and moved easily, the design does mean that it can feel less stable than the Power Cage options. Fortunately, that should only be a problem if you are performing more dynamic bodyweight movements, such as the CrossFit style 'Kipping' moves. Don't be mistaken, the product is certainly robust; when I talk about stability I mean a slight movement when using it which can make some exercises feel a little bit harder to beginner users. Of course, this is exaggerated if you aren't performing them cleanly and are using a lot of momentum to get over the bar. The easiest thing to do to combat this is weigh the base down with a couple of sandbags or weight plates if you have these to hand. One final factor to consider with a bar like this is that the max weight capacity is 110kgs (approximately 17 stone). If you're heavier than this you'll want to opt for one of the Power Rack type options. Of the bars reviewed in this post, the Gravity Fitness Pull Up Rack is my recommended pick. It's designed well and looks fantastic! Max user weight (for pull-ups): 120kg. The DTX Power Cage would be my top recommendation for a power cage type free standing pull-up bar. It's a quality bar, and best of all it's one of the cheapest on the market; likely because it does the job without being an all-in-one complex solution. The DTX Power Cage is one of the only free standing pull-up bars I've found where you can bolt it down to the ground, which is important for strenuous or explosive exercises such as muscle ups where other bars could wobble. The feet are also designed in a way where if you're not feeling too comfortable or don't have the option to bolt the bar down, then you can alternatively buy some cheap sandbags to keep the bar weighed down and stable. Even with the added expense of some sandbags, it is still the cheapest bars on the market. Max user weight (for pull-ups): 280kg. The 'Muscle Up Tower' sits at number 2 on the list. It may cost you a little more than the Pull Up Mate, but the reason it is so highly rated is that it's the only bar on the list that is suitable for people that are over 6ft (tall people rejoice!). With a maximum extension of 240cm, a 6ft person can comfortably hang from the bar without their feet touching the ground. There are in fact 7 different height settings altogether, with an available bar height ranging from 200cm up to 240cm. This makes the bar suitable for users of all sizes and also means it isn't limited to only users who have tall ceilings in their homes! Of course, those who are 6ft or over are also more likely to weight more than their smaller counterparts. Luckily for those users, the bar has you covered with a maximum weight allowance of 280Kg. That's over 2x the supported weight of both the Gravity Fitness Pull-Up Rack and the Pull Up Mate. As you may guess from the name, the Muscle Up Tower is a great choice for those who wish to use the bar for muscle-ups. Like the other free standing pull-up bars though, you're going to need to weight it down unless you can perform strict form muscle-ups. The bar has 4 holes to bolt the bar to the ground (one per corner), so for those who are comfortable with DIY, you can bolt the bar down to make it as rigid as possible. Using this technique, you can guarantee that the Muscle Up Tower will be the most rigid of all the free standing bars on this list. For the DIY-avoiders out there who sweat at the thought of putting a shelf up, you can of course just weight the feet down with free weight plates or sandbags, but this method comes at a cost if you don't have any of that equipment lying around already. A final thing to note is that the Muscle Up Tower is sold by a German brand (TOY-FIT) but delivered by Amazon - delivery may take one to two weeks. Rather than share an image of the Pull Up Mate, I'm going to share their own YouTube product demonstration as I think it does a great job of giving the user an idea of the bars look & feel, and what you can do with it. In short the Pull Up Mate is a very similar choice to the Gravity Fitness Rack, but most noticeably it is slightly more expensive. But how does the Pull Up Mate compare vs the Gravity Fitness Pull-Up Rack otherwise?? They're both the same design/concept, however the Pull Up Mate has a slightly different base design to try and give it that narrow edge in terms of stability. The Pull Up Mate is also branded red and black which makes it slightly more appealing to the eye, for those who are more concerned about this! You could argue the different base design of the Pull Up Mate gives it a slight edge here, but as I mentioned earlier, I'd recommend both bars are weighed down with a few sandbags to really stabilise them as best as possible anyway. This is certainly less of a factor if you're only using the bar for basic pull-ups, dips and rows though, so don't let that put you off at all. Towards the end of 2018, the Pull Up Mate has also been introducing different variations of the bar, such as a slightly more expensive version with detachable dip handles. The only downside to the Pull Up Mate is that the product appears to be regularly out of stock. You will need to click the link below to check. Max user weight (for pull-ups): Unstated. The MiraFit Power Cage is much more suited to those looking to lift weights, but also want the use of a pull-up bar. At twice the price of the DTX Fitness rack, it's certainly one of the more expensive choices, but still remains good value considering what it offers. A great thing about this choice is the squat rack bars are fully adjustable, which is great as this becomes very useful for exercises requiring a lower bar, such as triceps dips and Australian pull-ups for example. The downside to this option is that it has no bolts (or bolt holes) to secure to the floor. The pull-up bar also has the same rough pattern that barbells use, which is great for weight lifting but can be annoyingly uncomfortable on your hands for calisthenics exercises. How Much Does a Free Standing Pull-Up Bar Cost? The bars listed in this guide cost between £90 and £150. There are cheaper alternatives which sell for as little as £65, but these are of poorer quality and are not recommended. On the other end of the scale, you can buy more extensive power cages for as much as £250, but these aren't the best value unless you want to add the power cage to a full barbell and weight gym setup. Can I Use These Bars For Dips And Roman Chair Exercises? The newer version of the Pull Up Mate comes with dip handles, but if you are looking for more of an 'all-in-one' solution with armrests and a padded back area then you may be better off with checking out a different product like the Bodymax Power Tower. Can I Transport a Free Standing Pull-Up Bar Easily? Yes! The top recommendations like the Pull Up Mate and the Gravity Fitness Pull Up Rack are designed to be packed away and transported easily. The bars should take no more than 2 minutes to assemble and will weigh around 20kgs when packed. Why not make the most of a sunny day and try a work out in the park? Can I Leave a Free Standing Pull-Up Bar Outside? I wouldn't recommend leaving the bar outside when not in use. Although the bars should be able to withstand poorer weather when working out, they aren't designed to be kept outside for longer periods of time. Doing so will likely cause the bars to rust. If you are looking for something that can be kept outside permanently, then I would recommend a wall mounted pull-up bar.